My friend had a birthday party with a light occult theme last night. Someone brought tarot cards and did some readings for people, which reminded me of my own deck sitting at home. I don't believe in divination, but I like playing with the cards as a mental exercise. I think you can gain some clarity on a situation in your life by applying the metaphor of the cards you draw to your question and seeing what swims up to the surface. Does anyone else like dabbling in this? Any cool deck recommendations? 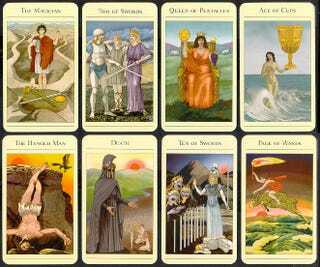 I have the mythic tarot deck pictured here, which is based on Greek mythology and is gorgeous.